Twenty-five percent of profits are given to the Save A Gorilla fund. Back when Jack MacPherson was tending bar at the West End, some dorky beer salesperson stopped in promoting a new type of Ale. Normally these people would get their asses reamed and run out. As far as Jack was concern, there were only a handful of beers worth drinking. However, this one sparked his attention for the obvious. “Silverback Ale,” the salesperson pitched, plopping a six-pack on the bar. Hummm … Albert, Silverback Gorilla, or Ale – sounds like an appropriated beverage that would fit perfect for Mac Meda. And of all things, brewed by the Wynkoop Brewing Company … in Colorado, United States since 1858 … another humm … is that not the same state that Coors is brewed, another Mac Meda beach favorite? 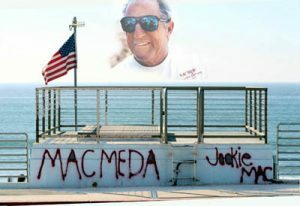 Mac Meda Postcard - thanks to JK for suppling it. When the salesperson continued to carnie his hype, Wynkoop Brewing Company was known worldwide for its beer … and Denver’s first brewpub … that was founded in 1988 … and produced 4,330 barrels of fresh beer in 1997, and blab blab blab, it went in one ear and the out the other … Jack became more mesmerized at the labels “bitchen” name. Was this an iconic salute to Bob Rakestraw’s hero? But when the salesperson pitched, that 25 percentage of the profits from this beer would go protect Silverback Gorillas, that finalized the deal; a sale was made of a few cases. And as for the beer, not bad tasting, in fact very good – it has a deep chestnut color that was a couple of shades away from black. Slightly smoky in taste, and not as carbonated as other beers. 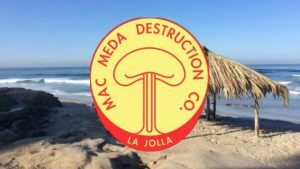 Later on Jack got the ideal of making La Jolla Mac Meda Postcards, with Albert representing the Silverback within … so he got the custom silk-screening of the Branding Iron to make a few. The design was from Cool Beans/J Madden. Don’t know how many were made, but maybe Doug can make a few comments. Either Jack started selling them or just handed them out for free – either way, many got some Meda surprise in their mailboxes. 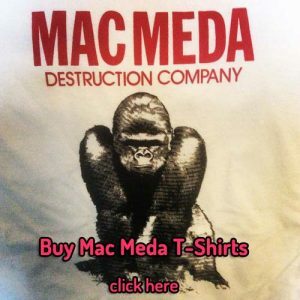 If only I had a dime for each time I came to macmedadestruction.com.. Superb post!